Velavan Senthilkumarcertainly has the knack of being in the news. That is not something to be grudged, because the young man has earned his popularity through his show of excellence in Squash. For instance, he is the only Indian to have won both the Asian Junior and the British Junior Open U-19 titles. Not even the current Number One player, Saurav Ghosal, has this coveted honour. When he left for his graduate studies to Columbia University in the USA, again thanks to his deeds in the sport, it seemed one more brilliant player from the country would fade away to the demands of studies. However, to him, and he has repeated this many times, Squash remains most important. But the question is how much time would he be able to divide between serious Squash and studies to take care of his life on the professional circuit. Not that it was beyond him. Vikram Malhotra, a non-resident Indian in the US today, is currently one of the top players serving the national team. Last year, around this time, when he was in transition from the junior ranks, Velavan had earned plaudits for coming into the final of two successive PSA events in South Africa. That signalled his readiness to take on himself the tougher challenges in the professional circuit. But would he be able to continue this consistently was the lingering question. A year later, this Chennai man has proved he still can piece together a creditable show. That described his maiden success in winning a PSA title at Madison in the USA itself. What was significant about this win was that Velavan had come into the event via the qualifying phase. His rankings had dipped beyond the 250 mark, not surprising for an occasional participant like him, and that meant he had to take the hard route of playing in the qualifying matches to earn a passage to the main draw. Only a week prior to Madison, Velavan had failed at the qualifing phase itself in another tournament in Rochester. Perhaps that reverse firmed his resolve to win next time, and with skill and grit in plenty, this young man scripted a memorable tale of success. There is promise of more to come. He has just returned home on vacation and is already charting out plans for the next three-four months to play in a few PSA tournaments in Asia. Quite a level-headed young man and one ready for hard work, Velavan has in him the qualities that any coach would yearn from his ward. 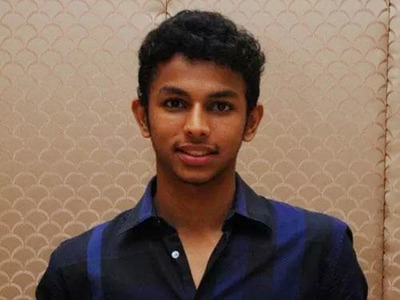 National Coach Cyrus Poncha, under whom this talent grew at the Indian Squash Academy, believes that Velavan has the making of a player who can go far in Squash, now that he has shown his mettle in Madison. But, studies… And that is a big BUT. As a child, Velavan’s parents were eager to put him into sports, if anything, to channelise the child’s abundant energy. Tennis was the first choice for the then Kilpauk-based boy but logistics did not work out well and so Squash came in handy for the 8-year old, says his mother Mrs. Priya. Quick to adapt and swift in what he did, Velavan was soon to draw attention and the rest is history for this former Don Bosco (Egmore) pupil. Good performance ensured he had the encouragement from the school authorities and backing him totally were his parents as he rose from a mere player to a champion.